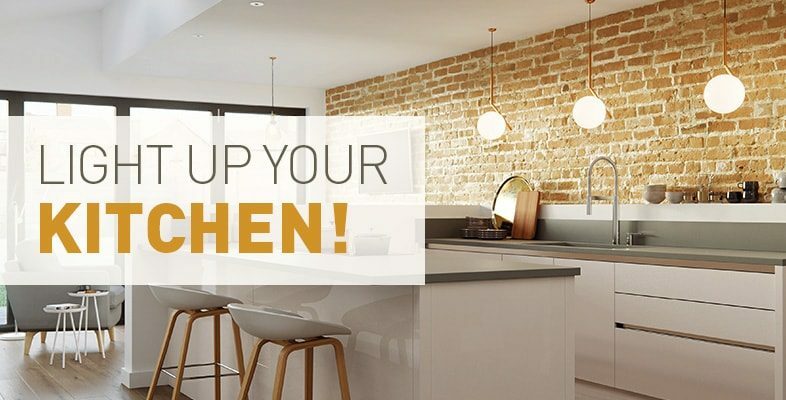 Direct Kitchens > Blog > Light up your kitchen! Direct Kitchens are experts in creating beautiful kitchen designs and installing them. We can also work on a complete project management basis taking ownership of any construction, electric and plumbing works required. We can ensure the entire process is stress free and the finished result is as the customer envisaged or exceeds all expectations. Most people believe that lighting accessories can be left until the final moment – even an afterthought – it can be, but we would recommend adding lighting to your initial kitchen design as it can make or break the kitchens ambience. Ceiling lights are what most customers initially think of, and yes, they are vitally important both aesthetically and practically. Ceiling lights can be made a feature of – a beautiful crystal chandelier or a row of four to five identical light shades over a kitchen island also look very effective, almost like a centre-piece. If you don’t want lighting to be a feature, why not add spot lights and a dimmer switch so an ambience can still be created when required. Up lighting can add depth and elegance to any kitchen. By adding clear or coloured bulbs to under kitchen units (both high cupboards and lower based storage solutions) creates an added wow factor and a real talking point! By adding LED lighting to the bottom of your units or having LED spots installed into your floor tiling, makes your kitchen pop. LEDS can be clear, coloured and even have settings to change the colour depending what mood you are looking to create. LEDs are also great value for money and have long life spans. When it comes to your new kitchen design, make sure lighting is a priority. It really could light up your life or leave you in the dark!